Reaching Abdullah’s camp at Abu Markha in Wadi Ais on 15 March, Lawrence delivered letters from Feisal explaining the situation in Medina and pressing the urgent need to block the railway; then succumbed to the bout of dysentery and malaria that had begun during his journey from Wejh. 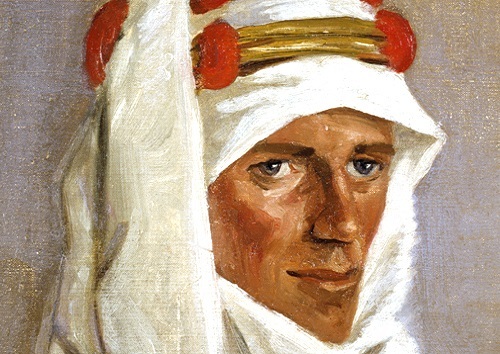 Lying incapacitated for days, he began to think out a new strategy for the Arab campaign. became actual to me … So I hurried into line my shadowy principles, to have them once precise before my power to evoke them faded. “Please see Sidi Feisul for me and tell him I have not been able to do my job here because I have been ill. I hope to go down to the railway tomorrow for a preliminary reconnaissance and after that will be able to say what can be done, but in any case I will stay here a bit as it is most important that the Turks should not be able to concentrate much of their Medina force at El-Ula against him, and I am afraid if I do not stay here not much will be done.